If you have any missing teeth, you know that gaps in your smile affect your appearance, but did you know that it affects your oral health, too? It’s true, missing teeth can negatively impact your oral and overall health if they aren’t replaced. Thankfully, dental implants in Downtown Los Angeles can restore your smile to it’s full and natural beauty, while maintaining your wellbeing. Keep reading to learn why you shouldn’t wait to complete your smile with dental implants. Dental implants are small titanium posts that are surgically placed in your jawbone to act as natural tooth roots. Titanium is biocompatible, so it actually becomes part of your jawbone. This is a sturdy and stable support for your dental restoration. With proper care, dental implants themselves can last for a lifetime. Why Are They a Great Replacement? Natural look and feel: Dental implants are the only replacement that mimics the way that your natural teeth emerge from your gums. 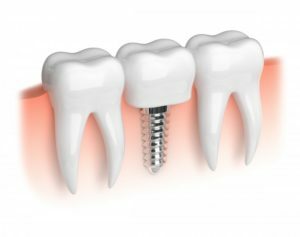 Bone preservation: Because they fuse to your jawbone, dental implants provide it with the necessary stimulation it needs to stay healthy and strong. Durability: As mentioned above, dental implants can last a lifetime, but they also increase the lifespan of your dental restoration (false tooth). Versatility: Dental implants can be used to replace one tooth, multiple teeth, or support a denture. It all depends on what shape your smile is in. What Happens if I Wait to Replace My Missing Teeth? Waiting to replace missing teeth can not only hurt your appearance and confidence, but it can seriously affect your oral health. Your teeth do the important job of keeping your jawbone strong and healthy. Their roots provide your jaw with the stimulation it needs. However, when you lose teeth, it’s not getting the same amount of stimulation, which causes your jaw to shrink and deteriorate. If your jaw becomes too weak, you’ll either need a bone graft to accommodate implants or you won’t be able to get them at all. If you’re missing even just one tooth, your surrounding teeth can drift and shift into the gap. Your teeth provide each other support, so even if one tooth is missing, your smile can shift out of alignment. This whole new problem will have to be treated with orthodontics. Crooked teeth can result in bite problems, which causes your teeth to come in contact with each other unevenly when biting or chewing. This leads to extra wear and tear in certain parts of your smile. After your smile is weakened, you may have to get dental crowns or veneers to restore the strength back to your teeth. Does it sound like you could benefit from dental implants? Don’t wait! Contact your dentist in Downtown Los Angeles to restore the beauty and health back to your smile. Dr. Adam J. Geach is a specialist in prosthodontics. This means he’s undergone 3 years of extra training in dental implants, dental esthetics, and reconstructive dentistry. He takes pride in completing his patients smiles in the most natural looking and feeling way. He currently runs his own practice, and he can be contacted through his website or by phone at (213) 622-3339 for any questions.